If we analyse longitudinal data, we are usually interested in the estimation of the underlying curve which produces the observed measurements. This curve describes the time course of some measured quantity like the behavior of blood pressure after exercise or the height growth of children. If, as usual, the single measurements of the quantity made at different time points are noisy, we have to employ a statistical method in order to estimate the curve. The classical method here is parametric regression, where we specify a class of regression functions depending on finitely many parameters, the so- called “parametric model”. Such a model is then fitted to the data by estimating the parameters, usually by the least squares method, sometimes, if realistic assumptions on the distribution of the measurement errors are available, by the method of maximum likelihood (Draper and Smith, 1980). 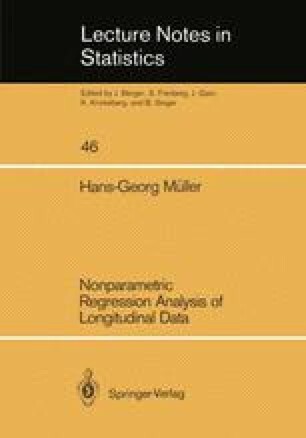 For regression models which are nonlinear in the parameters, an iterative numerical algorithm has to be employed in order to obtain the parameter estimates as solutions of the normal equations. This can lead to computational difficulties when we deal with sophisticated nonlinear models.